The App Settings page enables you to perform a number of important functions in the dashboard, which have effect on your app's data across all media sources. Therefore, access to this page is restricted to account owners only. To enter the App Settings page, click App Settings in the Configuration section on the left bar or access via the Settings button on the My Apps page of the dashboard. Below you can find explanations for the different setup options on the app settings page. After making any changes to the app settings you MUST click on the button at the bottom right corner, before leaving the page, for the changes to take effect. The AppsFlyer Dev key is a unique key per account, which is essential for the success of SDK integrations on all platforms. Developers can get the key from the App settings page. In the Analytics section you can define the parameter of a loyal user. By default, a loyal user is defined as a user who has opened the app 3 times or more during its lifetime. If you select one of the configured events in the dropdown menu, loyal users are defined accordingly. This change is reflected retroactively, so upon selecting a new event to represent loyalty, all the historic loyal user data is re-calculated to reflect the change. The default loyal user definition is highly indicative of user quality. However, it is also easy to replicate by fraudsters. AppsFlyer recommends using a more complex Loyal user trigger to increase the reliability of this KPI. For more details, read this. 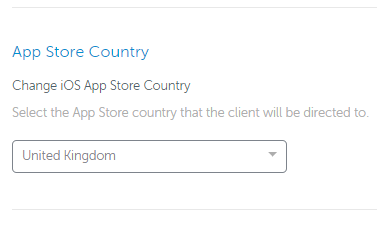 The App Store Country setting allows you to select the country in which your app is available. When the app is not available on the default US app store, you must select the country where the app is available. Otherwise AppsFlyer redirects users to their local country's App Store, based on resolving their devices IP. In the rare cases where this IP is unusable AppsFlyer redirects to the default App store in the US. 1. 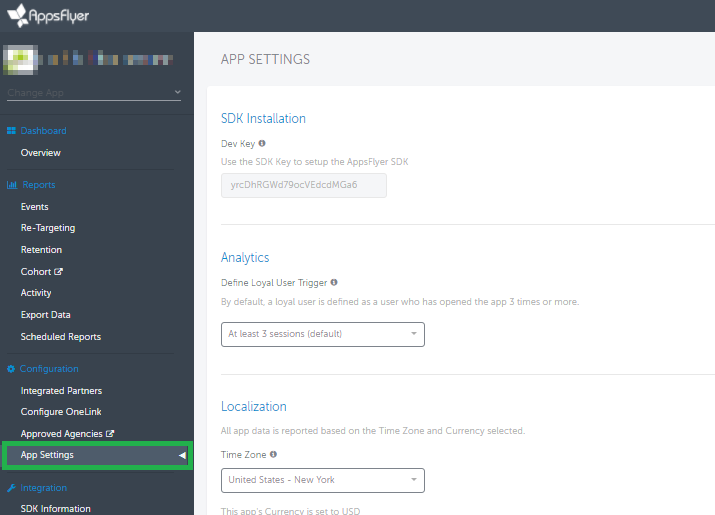 If the app is not available in the set country on the App Settings page, AppsFlyer is not able to retrieve and update your app's icon on the dashboard, causing it to seem "Pending". 2. iOS apps, that are available in more than one country, need to set the US as the app store country. By doing so, even if the app is not available in the US, the App store redirects users to their country stores. By default, all app data is reported based on the UTC(GMT) time-zone. 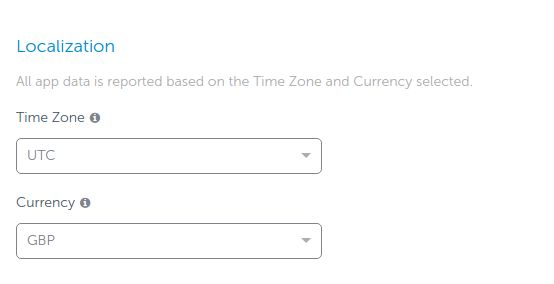 The time-zone setting here allows for changing the default time zone to any local time zone, to make data alignment easier. For more details about localization, see here. By default, the app's currency is set to USD. 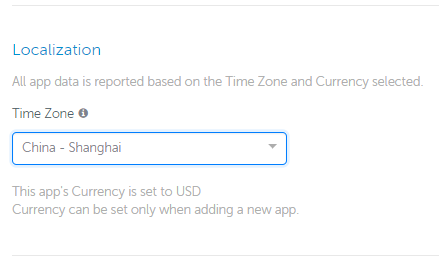 You can change the default currency via your App Settings page, under Localization. Below are the ways in which the data is presented in the various dashboard views and reports. The dashboard and Raw Reports present all of your data in your selected currency. Currency change is only available to apps with no revenue or cost. For new apps, the currency can also be set when the app is added. The Re-attribution window is a time frame starting from the first install time during which re-installs cannot be attributed as new installs. You can now change this window's value from the default 3 months to anything between 1-24 months. For more details click here. To enable or disable Retargeting campaigns measurement, with any supporting media source - toggle the On/Off button. For more information about retargeting click here. iOS apps that implement the iOS uninstall attribution feature need to upload the P12 certificate here. Android apps require a Firebase/GCM Server Key to be defined here for android uninstall attribution. You can toggle the On/Off button to enable app owners to mask the end-users' device IP addresses in the raw data reports. For more details about IP Masking, see here. For iOS 10.3 and above users only. Details here. The account's admin can determine the name of your app, which is then displayed throughout the dashboard and data reports. This is especially useful if you have different versions of the same app, for example for regional distribution reasons. Note that while this change affects the display of the app, the app ID, used to identify the app when using various AppsFlyer APIs, remains the same. app names are limited to 50 characters.